While looking back at the breakfast recipes I have posted thus far, I noticed that almost all of them are of the sweet variety. A bowl of granola, breakfast couscous, or instant oatmeal is a healthy start to the day, but sometimes I long for something salty and a bit meatier. I also find that I have more energy when I start the day with some protein in my meal. Bacon or sausage are my favorite breakfast proteins, but they have the obvious drawback of containing large amounts of salt and fat. For a few years now, I have been making a homemade breakfast sausage using ground chicken. This sausage is all-natural and lower in fat and protein than most store bought breakfast sausage. Don’t be put off making this recipe by the term sausage. There is no stuffing of meat into intestines or anything of that kind in this recipe. 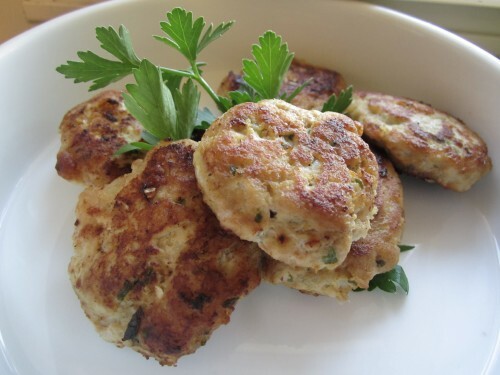 It is really more like a sausage seasoned ground meat that can be formed into patties or cooked like ground sausage. Making sausage from scratch may not seem to fit the “quick and easy” criteria that I promised for this series, but this recipe is really very versatile. I have often cooked a batch of these sausages for a weekend brunch and then refrigerated the leftovers to be reheated for weekday breakfasts. This recipe also freezes very well (either raw or cooked) so it’s possible to just pull a container of sausage from the freezer and let it thaw overnight before cooking it up for breakfast. With just a few minutes of preparation, this sausage can be just as easy to prepare as the store bought frozen variety but is much healthier. 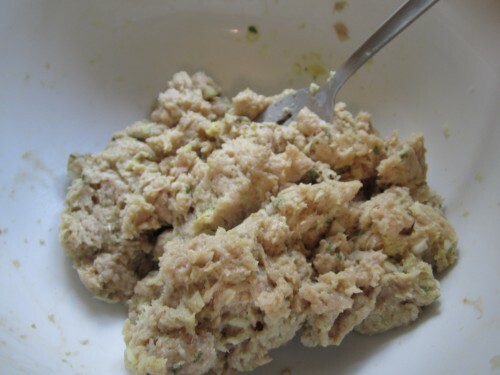 As mentioned above, this mixture can be formed into patties and cooked, or cooked like ground sausage to be used in breakfast burritos, quiches, etc. I have categorized this recipe as gluten-free but that designation somewhat depends on the brands of ingredients used. Lea and Perrins Worcestershire sauce is gluten-free but I’m not sure about other brands. Also, some mustards may contain gluten so be sure to check the package! I have used 2 pounds of ground chicken in this recipe to allow for extra sausage that can be frozen for later. 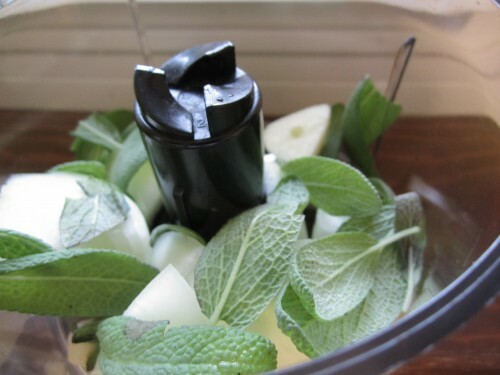 However, this recipe works very well cut in half also, if you just want a smaller amount. I have included three different kinds of herbs that can be used to flavor the sausage and I often vary the flavor according to the seasons. Sage is a nice, earthy flavor to use during the autumn and winter, but I prefer the lighter flavor of thyme in spring. 1. 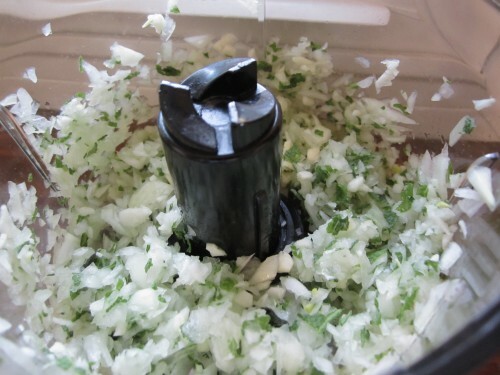 Using a food processor, finely chop the onion, herbs and garlic. You could also finely chop them by hand, but it’s hard to get them as fine using just a knife. 2. Scrape the chopped onion mixture into a large bowl and add the rest of the ingredients, except the oil. Mix lightly using your fingers or a fork, until all the ingredients are well combined. At this point, you can freeze any of the mixture you like in freezer bags or containers. It will keep in the freezer for a few months. Alternatively, you can cook the sausage like loose, ground sausage by frying it in a Tablespoon of oil, over medium heat, until no pink remains. The cooked sausage can also be frozen for a few months. To cook in patty form, see step 3. 3. Heat 2 Tablespoons of canola oil over medium-low heat in a cast iron or non-stick skillet. Using damp fingers, scoop up a heaping Tablespoon of the sausage mixture and form it into a small, flat patty, about 2 inches across. Cook in the hot oil until golden brown and cooked through, about 5 minutes per side. Drain patties on paper towels and repeat with remaining sausage mixture until it is all cooked. Patties can be frozen (after cooling to room temp) in freezer bags for a few months. To reheat, allows to thaw in the refrigerator for 24 hours before heating in the microwave, or wrapping in foil and heating in a 400 degree oven for 15 minutes.